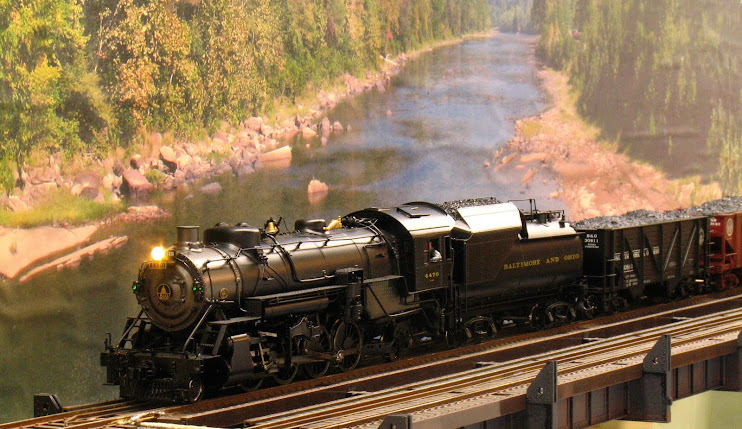 2-Rail O Scale Railroading: We don't need to build no stinkin' scenery! We don't need to build no stinkin' scenery! Scenery? Scenery? We don't need to build no stinkin' scenery! I've been meaning to try this little experiment for a while. Could I 'green screen' (chroma key) scenery onto an otherwise bare layout? With the help of a green fold-up school project display board from Wal-Mart I believe the answer is - yes. Don't click on 'HD" to turn on Hi Def mode unless you have a fast internet connection and a fast computer. Of course there would be ethical questions surrounding doing this without full disclosure. But I can see the utility of using this technique to try out scenery treatments. Interesting idea. I'm impressed. However, green cars would be a problem.